CLEARFIELD, Pa. -- A Pennsylvania restaurant thinks it has a winner. A Guinness World Record winner, that is. 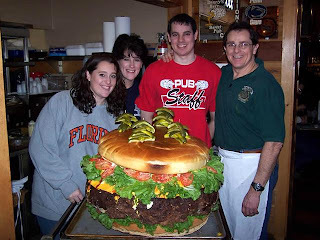 Chefs at the Clearfield eatery said they've created the world's largest hamburger, all ready to order right off the menu. Weighing in at 123 pounds, this giant burger features an 80-pound beef patty, a 30-pound bun, 12 tomatoes and 160 slices of cheese. Denny's Beer Barrel Pub also throws on a pound each of lettuce, ketchup, mustard and mayo -- and up to five onions. The menu price for the Beer Barrel Main Event Charity Burger comes to $379. The pub plans to submit paperwork to Guinness World Records this week. The owner, Denny Leigey, said he came up with the idea of the giant burger through an "evolution of burgers." "Starting with a 1/4 pound in 1977 and a friendly race with another eatery in Clearfield," he said. "1991 began the larger burgers a 2 pound and a 3 pound in 1993." And, he said, the rest is history.